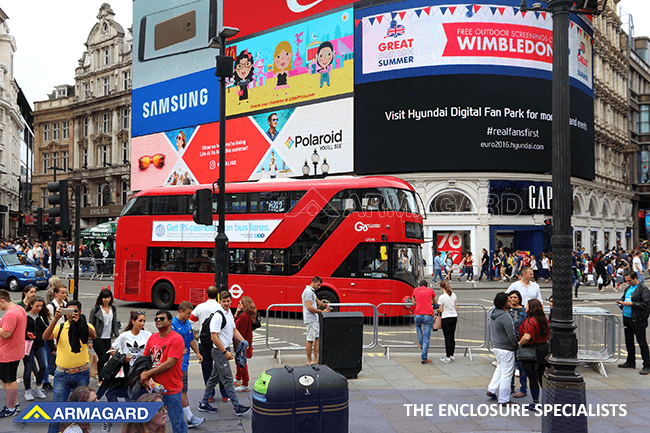 2019 OOH Trends to Watch Out For | Armagard Ltd.
2018 marked a tipping point for the OOH industry, with digital OOH (DOOH) advertising surpassing traditional OOH for the first time. According to Pricewaterhouse Coopers (PwC)1, digital OOH advertising spend hit £513 million midway through the year, up 9 percent. Meanwhile, traditional OOH advertising spend reached £484 million, slumping 6 percent. Digital out-of-home advertising is set to increase in 2019. The rise of digital out-of-home advertising has been rapid over the last five years. In fact, according to PwC, digital out-of-home deployments will have increased by over 13% between 2014 and the end of 2019. DOOH is fast becoming a far more prominent advertising medium than any other. With more people spending time outdoors, DOOH is able to reach mass audiences quickly and consistently. 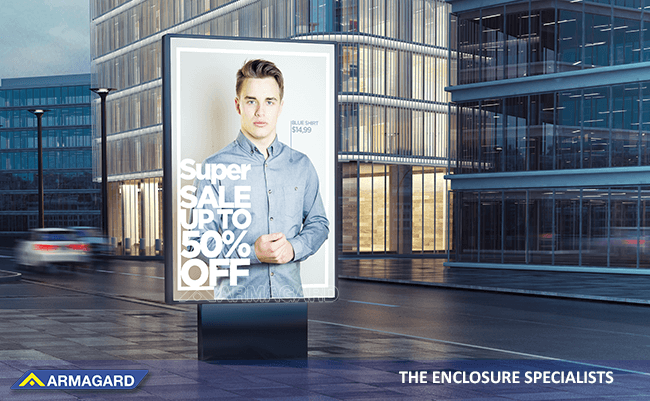 Meanwhile, DOOH enables advertisers to communicate with audiences in increasingly versatile ways, helping to achieve a higher return on investment. Expect to see an increase in DOOH deployments in city centres, at bus shelters, train stations, airports and shopping malls, as advertisers look to push the boundaries and bring in a new era of OOH advertising. To maintain the momentum of reaching mass audiences, expect advertisers to get more creative with their OOH advertising campaigns, especially when it comes to digital. Back in 2014, Pepsi set the bar with a fantastic, bus shelter campaign2 using augmented reality. Not only did Pepsi’s campaign have a huge impact on the streets, video views of the campaign across social media, reached nearly 7 million. Meanwhile, Barncancer Fonden, a youth cancer charity in Sweden, created an incredibly emotional DOOH campaign at underground train stations. The OOH deployment used motion sensor technology that recognised the arrival of trains, prompting the nearby digital displays to start playing the story of a woman’s fight against cancer. 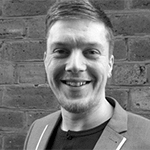 Expect to see more touch screens, facial recognition technology and the gamification of DOOH deployments, as advertisers look to engage with audiences on a whole new level. Adding an interactive element to DOOH is proven to increase customer engagement, increase dwelling times, raise brand awareness and boost loyalty. Why? Interactivity creates curiosity and makes OOH advertising much more memorable. The benefit of interactive DOOH deployments is that they’re a great way to gather audience data, personalise the advertising experience and give directional cues. For example, an interactive DOOH deployment in a shopping mall is a great way for retailers to direct customers to their stores. Recently, to coincide with International Women’s Day, Women’s Aid3 launched an awesome DOOH campaign using facial recognition technology. The digital advert displayed a victim of domestic abuse, covered in bruises. As more people stopped to look at the ad, the facial recognition technology would recognise that people were paying attention to the advert, and the bruises on the victim’s face would start to heal. This communicated the benefit of not turning a blind eye to domestic abuse. As DOOH advertising increases in prominence across urban locations, expect to see the emergence of specialist networks, deployed in specific locations to target relevant audiences. For example, advertisers looking to target financiers, are likely to consider a DOOH deployment in a city’s banking quarter. Expect to see a rise in big brands using out-of-home advertising. With OOH advertising reaching mass audiences more than any other media, unsurprisingly, the world’s biggest brands have taken an interest. Expect to see more big brands using OOH in 2019, to reach audiences on an entirely different level. 2019 promises to be another big year for OOH. Following on from the successes of 2018, there’s an anticipation that the value of the OOH industry will increase in the New Year. There’s certainly excitement around the continuing development of DOOH deployments, which continue to reshape advertising in urban locations. Industry experts are predicting ever more elaborate deployments as OOH advertisers look to push the boundaries and capitalise on the impact that outdoor advertising trends are having on society as a whole. 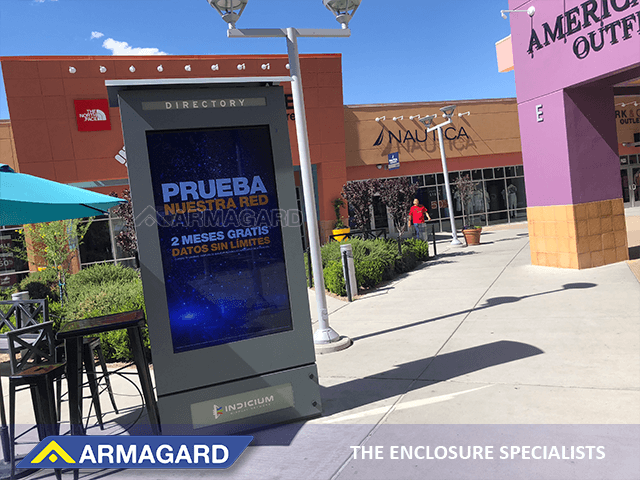 For more information on outdoor digital signage advertising, call Armagard on 0121 608 7226.